You can choose to display a sidebar on the home page. To enable the sidebar, go to Appearance > Customize > Front Page > Sidebar. If the position is set to Top, the sidebar will appear next to the banner or slider. If the position is set to Bottom, the sidebar will show up after banner or slider. For a demo of the sidebar below the banner, click here. For a demo of the sidebar next to the banner, click here. 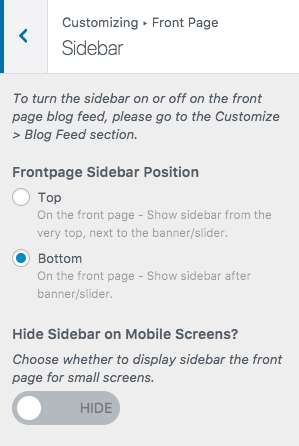 If you wish to hide the sidebar on the front page, you can go back to the main Customizer menu and switch to Blog Feed settings. The specific setting is described here.